Patrick Battuello, chronicler of racehorse killings at Horse Racing Wrongs, recently reported the death of 7-year old Sing the Dream in a claiming race for 4 yo’s+ at Aqueduct, Saturday afternoon, January 27, 2018. Alex Brown is the author of three books, Missionville, Greatness and Goodness: Barbaro and his Legacy, and Becoming a Clear Admit: The Definitive Guide to MBA Admissions. Brown has had a career in horse racing spanning 25 years, and a career in MBA admissions of more than 20 years; both careers overlapped. Brown started his horse racing career in the U.K. before moving to the United States in 1987. Since that time Brown has worked as an exercise rider and assistant trainer for leading trainers that include Steve Asmussen, Michael Dickinson and Barclay Tagg. Brown returned to the U.K. in 2015. Brown also gained an MBA degree during his early years in the United States, and then worked in MBA admissions at the University of Delaware, the University of Pennsylvania's Wharton School and Clear Admit. During that time he also taught in GMAC's Professional Development Program. Brown has also taught marketing-related courses for more than 20 years, and was a pioneer in the use of the internet for marketing. Becoming a Clear Admit (2016) is the result of Brown's experiences in the MBA admissions industry and continues his interest for providing better transparency to the industry. Greatness and Goodness (2011) combines Brown's interests in social media and horse racing. He established the timwoolleyracing.com blog in 2004. This site became the "go-to" resource on the internet for following Barbaro's progress at New Bolton Center after his Preakness injury. 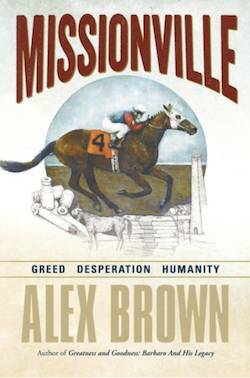 Brown maintained the site while Barbaro was fighting for his life, and then for three years afterwards while Brown traveled throughout North America, by racetrack, to do additional research for this book.